Slick design. 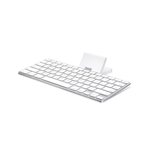 Provides a physical keyboard for the iPad. Doubles as a stand for photo or video viewing. Charges iPad when docked.